When I saw a couple of Greater Coucals on a branch of the tree outside my window, I grabbed the camera and rushed. Luci pushed past me. That of course, is standard procedure. She takes the role of my protector really seriously. She HAS to check out the area before she lets me enter. On the days she wakes up from sleep and finds me already out on the balcony, she quietly comes and sits behind me, pulling a long face. I swear that’s the truth. 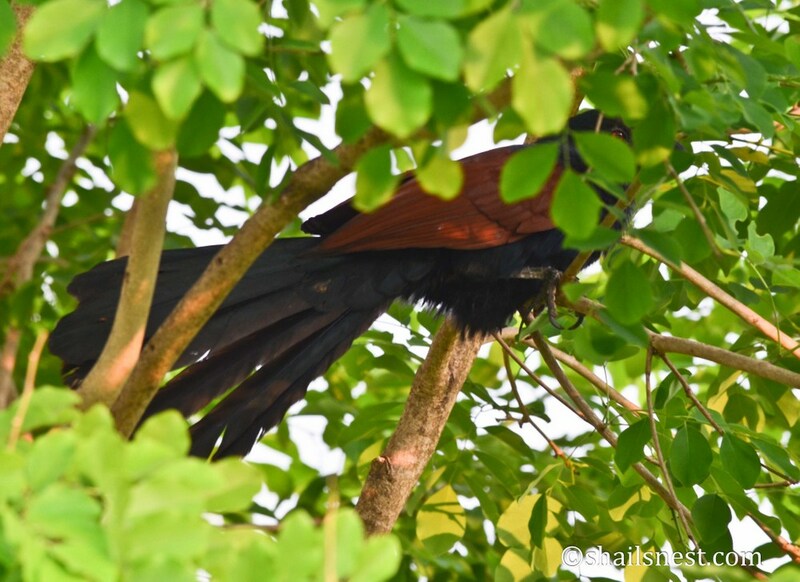 Getting back to the Greater Coucal, seeing a Chempothu, Uppan or Chakoram (some of the Malayalam names) is considered pretty auspicious in our part of the country. Not that that was what got me going. My sole purpose was to enjoy the bird and get some good clicks. The good sport that the bird was, it was most obliging. The dog thinks birds are things to be barked at. So, first I had to deftly divert her by pretending I was interested in something on the opposite end of the terrace. Assuming there was a cat thereabouts she took it upon herself to keep watch for it to reappear. After a while, getting bored, she started scanning the road below for cats. In the meantime I quickly took a few shots. 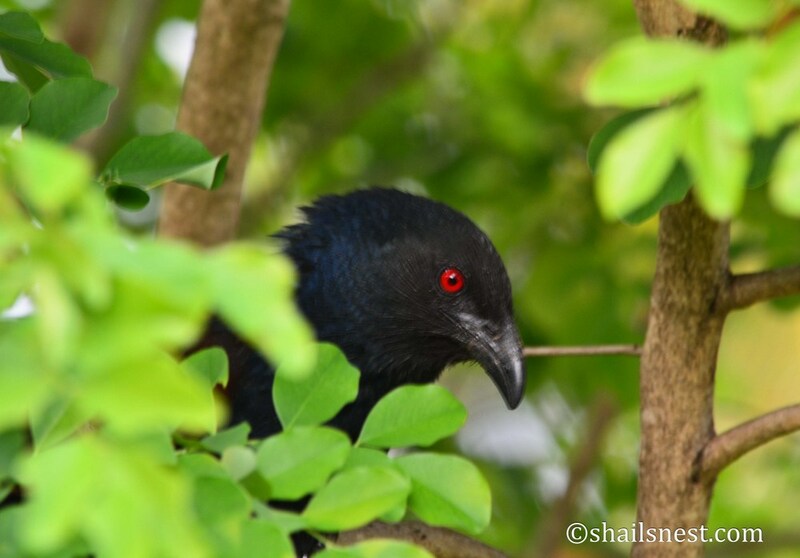 The bird really let me get up close and at one point was looking directly into the camera lens. It seemed absolutely okay with me hanging around, only flicking its head this way and that when it heard the clicks. Or was it doing that for me to get the better profile? Look at how it even fanned out its tail for a picture? The *ruby red* eyes are amazing, aren’t they? Soon the bored dog returned. She stood by me wagging her tail, as if asking, ‘What next?‘ Just about then, the bird started going goop-goop-goop in earnest. It was a sight to behold, the head bent in concentrated effort, the throat/chest bulging with each goop. I decided to record it, but had not reckoned with the dog. The Wiki says about the bird’s call, “They have a familiar deep resonant call which is associated with omens in many parts of its range.” Omens, I don’t know, but deep and resonant it certainly was. The dog stood shocked. This could not be happening, not so close, and certainly not during my watch, screamed her body language. She found the source before I could even say ‘Luci, no!’ (as if she would listen! ), and let loose a volley of barks at the Impertinent Bird Who Dared Disturb The Peace. By the way, only she herself is allowed to do that according to her. The bird stopped mid-goop and stared at the dog offended. It had been trying so hard to impress its lady love hiding in the foliage above. 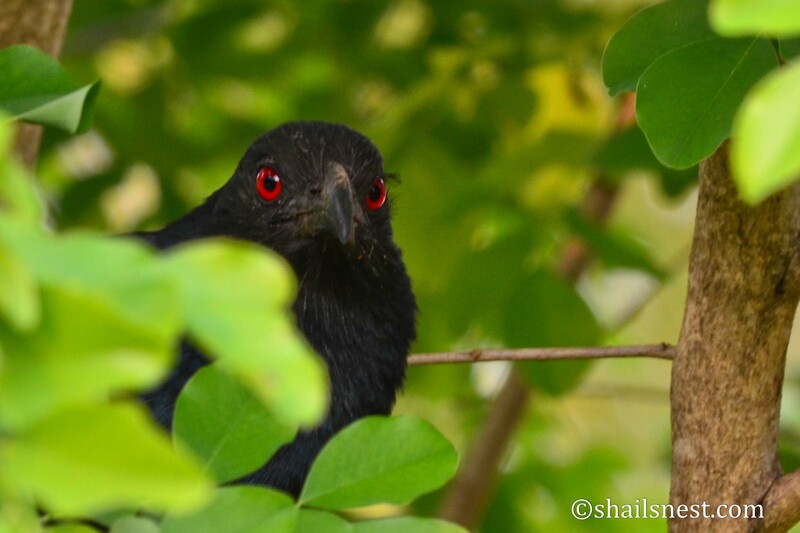 There was the other bird on the coconut tree nearby, waiting for its chance to woo the lady. To be told off like this in front of her and the competitor! What a disaster its pre-Valentine’s day had turned out to be. And it had counted on telling ‘I love you’ to the lady love in the morrow, in full view of the Mahasabhaites too, so that they would get the birds married right away, human-style. The dog had ruined all its plans. 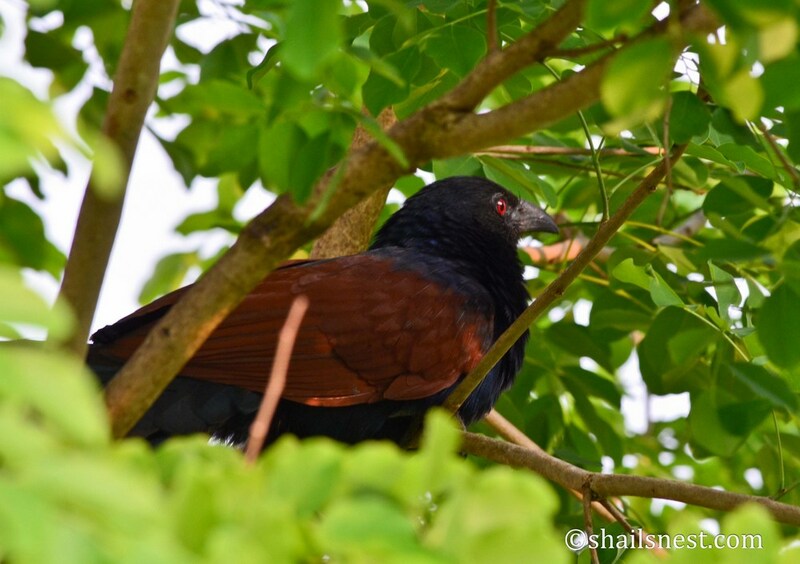 Never heard of a coucal, but it’s definitely a beautiful bird ! I have never seen one even when I went to India :). You’re definitely lucky that you were able to get some shots before Luci chased the bird away from her territory hehe. Luci has the bird marked ever since she heard it go goop-goop-goop! Lol. Jagadamba is also their name, in Telugu! Why is it called Chempothu? Never seen something that looks less like ‘pothu’.